During the Bon season in July and August, the temple hosts a Bon Dance with live taiko performance on the yagura. Join the excitement of dancing, food, and fun! 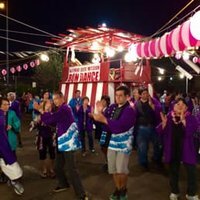 Members of Taiyoji and the surrounding community celebrate the festival to commemorate our ancestors who have struggled to protect the Japanese cultural tradition in Hawaii. With history of over 100 years, Waipahu Soto Zen Temple Taiyoji currently serves as not only a place for rituals but as a place for the community to gather for many activities, such as Zen meditation, yoga, and Buddhist study sessions. It also promotes Japanese culture through Sumi-e, a calligraphy painting class. The tradition of Japanese culture is what allows many young Buddhists to find their past, future, and cutural identity. With much collaboration between the Japanese, Hawaiian, and American cultures, Tiayoji has established a Buddhism unique to its own tradition. Friday, 8/3 - 7:00-10:00 p.m.
Saturday, 8/4 - 7:00-10:00 p.m.
daniyang8 . Última actualización Jul 12 2018 10:33 a.m.